Does peering into the maw of a live volcano fit your idea of adventure travel? Would contemplation of nature at its rawest fill you with awe – or instead have you searching determinedly for the nearest exit? Volcanic pyrotechnics, connoisseurs of the exotic will be happy to know, aren’t so difficult to come across as one might expect. Along the fold of our earth’s crust which hosts the bouquet of countries comprising Central America lies Guatemala, a destination deservedly famous for both the vibrancy of its native culture and its link with this greatest of nature’s spectacles. Either would be lures even for the experienced world traveler. But it was our quest for an up-close encounter with a live volcano that drew my wife and I there. You see them clearly on the descent from the skies into Guatemala City’s international airport. 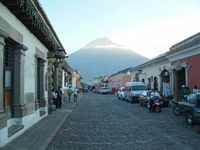 Towering over the western approaches to the city, Volcan (volcano) de Pacaya makes its massive presence felt before even the seatbelt lights go out and your airplane rolls up to the arrivals gate. Other volcanoes – Fuego, Agua and Acatenango – also beckoned in the distance. But it was in fact Pacaya, one of the most active in all of Latin America, that we were here to see. And the following day’s short journey to the cobble-stoned ambience of nearby colonial Antigua provided all necessary arrangements. 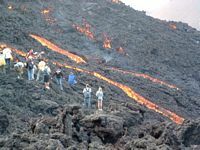 Volcano treks organized by various Antigua outfitters typically cast together whatever hodgepodge of travelers happen to sign up for a given day’s adventure. Ours included an international dozen of much younger sorts, many down from American colleges on winter break. The first few hundred meters of trail tested our meddle indeed. It was quite steep, showed no sign whatever of becoming less so, and at an altitude particularly hard on travelers mere hours away from their native lowland habitats caused no small amount of consternation. But the trail also quickly uncovered the first of several strategically-placed alcoves peopled by the older brothers of the walking-stick boys – offering mountain ponies for hire. We obviously weren’t the first climbers to have second thoughts about doing this whole thing on foot, nor likely the last to contemplate chucking heroic exertion in favor of taking in the spectacular mountain scenery from horseback. Relieved once again of a modest number of quetzales, we proceeded onward and upward mounted in saddles. The trail continued its twists and turns, now in sunshine, now in shade, for some ninety minutes, often breaking upon spectacular panoramas of the surrounding mountains as well as the highland valley within which Guatemala’s capital city is sited. Eventually we found ourselves above the tree line, on a broad ridge of the mountain quite near to its summit, with only a last expanse of solidified lava flow separating us from a quite sudden and iridescently startling display of molten lava rivers flowing freely down the mountainside. Here at last was the primordial thrill we had come for – striated across a broad rock face of hardened magma perhaps only hours removed from its own dramatic creation. College kids being what they inherently are, one soon produced a bag of marshmallows which he and others delighted in toasting over isolated pockets of still-hot rock within safe arm’s reach. The mode of toasting apparently took nothing from whatever tastiness marshmallows may be thought to have. But I couldn’t help wondering if such a mundane use of an active volcano’s power was prudent. 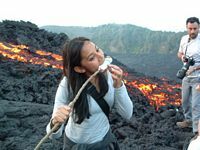 This particular volcano had, after all, only days before erupted with an excess that could easily have roasted anything located at either end of a marshmallow stick. Might its today’s gentle mood be only some passing whim, quickly to be forgotten in the face of such irreverent provocation? Sunset and the gathering darkness rescued me from such doubts, though only by forcing us away from Pacaya at perhaps its most dramatic hour. And on the trip back down the mountain we encountered a thin stream of other trekkers headed exactly in the opposite direction. Loaded with camping gear, they trudged heavenward clearly determined to make the nighttime an ally to their own volcano viewing experience. Our own now consisted mostly of finding our way down a darkened trail which tested us, its entire length, with protruding tree roots and slippery, pumice-powdered rocks. We’d all been advised beforehand to include a flashlight along with our day’s kit, and enough had taken the hint that our descent was conducted under reasonable illumination and with perhaps a minimum of stumbles. Our young collegiate companions, furthermore, proved themselves unfailingly considerate of our own necessarily slower progress. Once again at the trail head, the afternoon’s stick boys now did their evening best to encourage the donation of our no longer useful hiking sticks. Re-deposited into our vans, an hour’s drive placed us back again in quiet Antigua, dropped off in the central square in time to mix with currents of travelers sampling the tasty foods that nighttime street vendors delight in offering. Afterwards came time to leisurely single out that perfect restaurant for the evening’s meal – and to wistfully scan a darkened horizon for the glow of distant lava flows atop the Volcan de Pacaya.